Natural color equals natural brilliance. This charming Natural Colonial Kid's Rocking Chair allows the beauty of the wood to shine through. The Giftmark company designed this children's rocking chair. This handcrafted rocking chair comes to you courtesy of the Giftmark company, a trusted name in the rocking chair industry. Each and every spindle of this solid hardwood chair was given intense attention to detail and quality. The durable construction ensures a worry-free experience: it can take plenty of punishment which is important when kids are involved! This chair is ready to become the heirloom piece that your children will pass on to your grandchildren. You'll love the way the gleaming, smooth, polished wood feels beneath your fingertips. You'll also love how it's specially sized and designed with kids in mind: the ten inch seat height and a 12.75 inch seat width are "just right." Rocking chairs make memories. Just imagine your child sitting in his or her chair with a book and a stuffed animal, rocking away a lazy rainy afternoon. Note that this chair was designed for indoor use only. This chair is also a snap to assemble with the help of the enclosed tool kit. 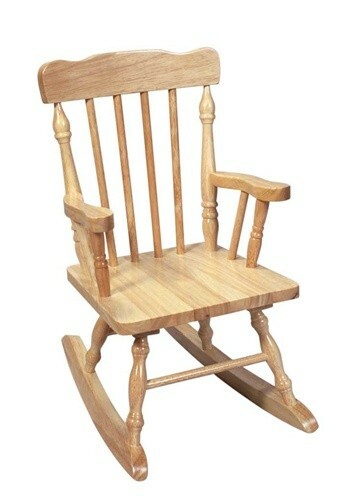 Order your natural wood Colonial children's rocking chair today.